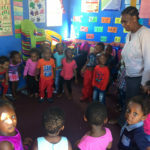 Situated in Mandela Park, Khayelitsha, Bathandwa Day and Night Care Centre was founded by Mrs. Virginia and Mr. Oliver Simelela in 2000. In that year, Virginia found a child wandering the streets who had been left orphaned and destitute after domestic violence took the life of the child’s mother. Virginia’s love for children moved her to take the child in. Soon after, other members of the community and provincial social workers were referring more abandoned and/or orphaned children to her home. Bathandwa translated means ‘to be loved’, and Virginia has certainly provided love to each of the children in her care. Her home provides full time shelter for the children, food, clothes, and education. CHOSA works with Bathandwa on capacity-building measures and helps them to fundraise.